Modern municipal heating systems help thousands of Tibetan students escape the cold. Not so long ago, many schools in Nagqu prefecture, the Tibet autonomous region, kept warm in winter by burning dried yak dung. It was smoky and inefficient, but with an average altitude above 4,500 meters and temperatures dipping as low as -30C, it was necessary. That is why modern school heating projects have been prioritized in Tibet in recent years, with an update on their progress delivered as part of the 2017 government work report during the fifth session of the 10th Tibet People's Congress recently. In Nagqu prefecture, more than 53 percent of schools have been equipped with modern heating systems, benefiting about 40,000 students, according to the local education bureau. 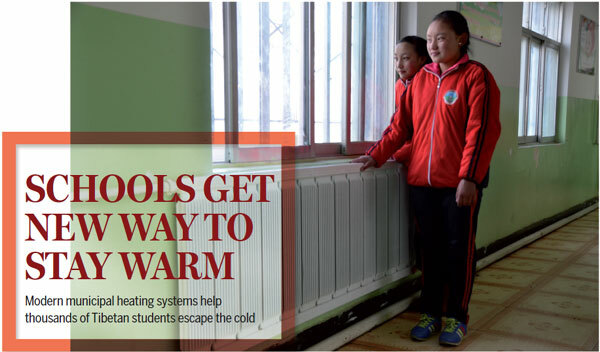 Tsering Wangmo, a teacher in the prefecture's Nyanrong county, said her school was first fitted with a heating system in 2014, which now covers the dining halls, classrooms and both students' and teachers' dorms. "It is much more convenient and healthy to use the heating system," she said, adding that the traditional method of burning dung was time consuming and created a lot of smoke. Trinley Dargyee, the Party head of Nagqu county, said school heating projects had already begun to have an effect since they were first introduced in his county in 2015. "As an increasing number of rural schools in our county are provided with the heating system, the grades gap between the rural and urban students has narrowed obviously," said the 42-year-old. "The new hot water heating system has helped to improve the living conditions and hygiene of both the students and the teachers." Tenzin Yangkyi, a primary student in Nagqu town, Nagqu county, said the heating system had encouraged him to study harder. "I no longer feel cold while working in the classroom and feel like I want to study more," he said. In addition to schools, municipal heating is also being introduced to whole cities and towns in Tibet, such as Nagqu town, which became the highest town in China to benefit from such a system when it started running in October. "With the heating system in my apartment, my family no longer need to burn yak dung to keep warm, and it is very warm in the house," said Zamgyal, a resident in Nagqu town. So far, more than 120,000 people have benefited from municipal heating engineering project in Tibet, according to Xinhua News Agency. In Nagqu, the heating system covers an area of more than 1.66 million square meters, covering the entire center of the town, Xinhua News Agency reported.